Basic Information: What is Lamberts Florisene for women? 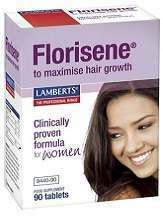 This review of Lamberts Florisene for women has been written keeping in mind the advantages and disadvantages of this product for women. Specially designed for the requirements of women, this supplement helps women who are suffering from Chronic Telogen Effluvium which means a condition where there is excessive hair fall but that can be reversed. This product is available on its website as well as on other shopping websites. This supplement is supposed to be taken an hour before meals or best on an empty stomach with water. For first 6 months one should take 1-3 tablets daily and after 6 months it should be reduced to 1-2 tablets daily. One should avoid taking tea, coffee or milk for an hour after taking the supplement as it can affect the absorption of the supplement’s nutrients. The price at which it is available on its website is £15.65 for a bottle which contains 90 tablets while a three pack is available for £46.95. There is a free booklet which comes with it to self-assess your improvement. I have been taking the supplement for a month now and I can see the difference in the growth level of my hair. My hair is now stronger and thicker. I will continue to take this supplement for six months as prescribed by the supplement. There is a list of things that has been mentioned by the manufacturers of this supplement which people should keep in mind while taking this supplement. There is advice for people who can get allergic to the ingredients which are present in the supplement and following are excluded in the supplement like yeast, milk, soy, fish and nuts. One should not take iron if taking these supplements. Women who are pregnant should consult their doctors before taking this supplement. It should be taken along with other antibiotics and if one has taken any medication then one should take this supplement after two hours. Since it is high on iron, one should be careful regarding the intake. There is no manufacturer’s commitment that is available on the product’s website. The customer reviews that are present on the product’s website and on other shopping websites are positive and promising. Lamberts Florisene for women is a specially designed supplement for women and is made of natural ingredients. The only downside of this supplement is the lack of warranty or return policy offered by the manufacturer but on the quality and feedback front, the product is good. What makes it different from other supplements is that it has stated out in detail the side effects that can be caused and what should be avoided while taking this supplement. Although how to take this supplement hasn’t been out lined clearly, it still makes for a good supplement.